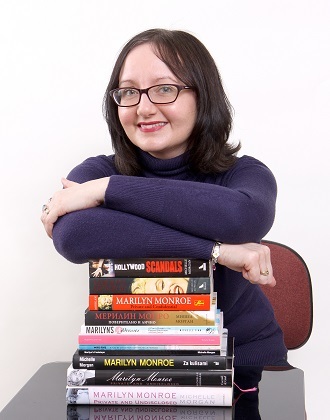 Last month I had the pleasure of interviewing Michelle Morgan – Marilyn author . Michelle lives in the UK with her husband and daughter and is an active member of the Marilyn fan community. When did you first discover Marilyn? It was 1985 and I was 15 years old. I was on holiday with my parents and saw a photo of her in the gold lame dress. A few months before that, I had watched ‘River of No Return’ and I was a also a big fan of Madonna’s ‘Material Girl’ video (where she dresses as Marilyn in the ‘Diamonds Are A Girl’s Best Friend’ number), so Marilyn was on my radar at the time. However, it wasn’t until I saw that postcard that I started to wonder what she was like as a person and an actress. I decided to buy a book about her so that I could read it on the beach. I was lucky enough to find the Fred Laurence Guiles book, and it was such a big moment in my life that today I could still pinpoint where exactly it was on the shelf of the shop! I started to read it that day and was immediately hooked. By the end of the holiday, I had spent all of my pocket money on postcards and pictures. I remember my mum asking if I was sure I wasn’t wasting my savings on these things. Little did she – or I – know that my little fascination was going to grow into a lifelong passion! The next year – 1986 – we went to Bournemouth and I spent all of my holiday money on every Marilyn book I could find. I remember getting the Andre De Dienes and James Spada books on that trip and I still absolutely love them to this day. What was it that inspired you to write about her? I’ve written five professionally published books about her – ‘Marilyn’s Addresses’ (As Michelle Finn, 1985); ‘Marilyn Monroe: Private and Undisclosed’ (2007); ‘Marilyn Monroe: Private and Undisclosed New Edition’ (aka Private and Confidential, 2012); ‘Before Marilyn’ (with Astrid Franse, 2015) and ‘The Girl’ (2018). I’ve also self-published ‘The Marilyn Monroe Address Book’ (1993); ‘Marilyn’s Footsteps’ (2012) and ‘The Marilyn Monroe Journal’ (2016). I decided to write my first book – ‘The Marilyn Monroe Address Book’ – because when I went to Los Angeles in 1992, I had no clue where to look for Marilyn locations, except of course Fifth Helena Drive and Westwood. So when I got home, I compiled everything I could find into a book and luckily for me, a publisher noticed it and wanted me to write a bigger version, which turned into ‘Marilyn’s Addresses’. I came to write ‘Private and Undisclosed’ because I had been talking to an agent about the possibility of doing another reference book about Marilyn, and he said he would be much more interested in a biography. I first thought that there was no way I could undertake such a thing. However, I gave it a go and before I knew it, I was finding all sorts of information and people that had never been mentioned in previous books. During that time I gave birth to my daughter and then the agent decided he did not want to represent me after all. However, I persevered and whenever my daughter was asleep I would write and research. I found an agent for the book in 2005 and then it sold in 2006 to publishers in the UK and USA. I was absolutely ecstatic! The paperback version came as a result of wanting to revise the hardback edition and it went onto become a bestseller in the UK WH Smith chart and others. It also sold translation rights in Russia, Poland and Bulgaria and continues to sell well. At that point I thought I’d probably written all I could about Marilyn, but then along came ‘Before Marilyn’ and now ‘The Girl.’ I’m thrilled to have worked on both of these books and will continue to write about Marilyn whenever a good project comes along. Was there anything that you uncovered about Marilyn or her life that surprised you? Many, many things. Finding her early boyfriend Bill Pursel was probably the most surprising and inspirational. He had never, ever spoken about Marilyn before and to find him truly blew my mind! I remember talking to him on the phone, very late one evening in 2005. I couldn’t write down his stories quick enough! They were absolutely wonderful and gave me a huge insight into Marilyn’s early career (1946-1950) and what she was like as a person. The story of her driving back to Los Angeles from Las Vegas after the divorce from Jim Dougherty, was especially interesting. It involved a broken-down car, a long, hot walk and being searched at the border crossing! Bill was also at Aunt Ana’s house when Norma Jeane came back from her Fox screen test! His stories appear in ‘Private and Undisclosed’, 2007 edition, but go into a lot more detail in the 2012 edition. You can pick up Michelle’s books on Amazon right now (I’ve included links to them in the text above). Come back soon for part two! What Is Your Favourite Marilyn Movie? irishmarilynmonroefanclub.com creates no claim or credit for images featured on our site. All visual content is copyrighted to its respectful owners and we make every effort to link back to original content whenever possible. If you own rights to any of the images, and do not wish them to appear here, please contact us and they will be promptly removed.